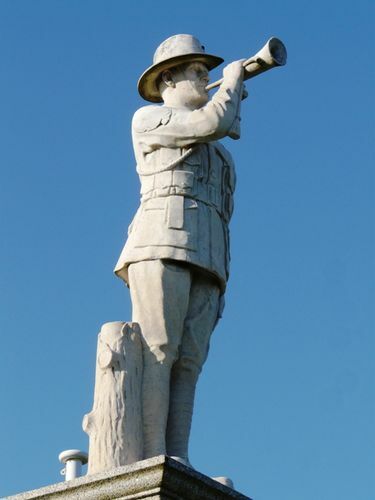 A monument commemorates the servicemen from the East Geelong, St Albans and Moolap districts who died in service or were killed in action in World War One. The committee of the East Geelong Soldiers' Memorial extend a personal invitation to members of the Fathers' Association and parents, relatives and friends of fallen soldiers to attend the unveiling of the memorial on Saturday next at the corner of St. Albans and Boundary roads, East Geelong, near the show grounds, at 3 o'clock. Drags, cabs and motors will run at 2 o'clock at the usual charges. The memorial is a beautiful work of art, and well worth a visit of inspection. The site of the memorial is known as Siberia Gate, on the east side of the show grounds. It has cost £600 to erect, and the whole of that amount is in hand. It bears the names of 45 district soldiers. Friends of the fallen and others knowing of names omitted from the memorial are requested to communicate with the secretary. Geelong Advertiser (Vic), 10 November 1921.